B'resheet/Genesis 42:18 And Yosef said to them on the third day, "Do this and live; [for] I fear G-d."
This period of time - three days - is quite well attested in the Bible. Hebrew even has a special word for "the day after tomorrow": . The phrase "the third day" occurs fifty times in the Hebrew texts and thirty times in the Greek texts; the phrase "three days" occurs another forty nine times in the Hebrew texts and twenty-five times in the Greek text. Most of these occurrences are a simple matter of time-keeping, in the same way as the fourth or sixth day might be, for example: "And on the third day, behold, a man came from Saul's camp, with his clothes torn and dirt on his head" (2 Samuel 1:2, ESV) or "On the third day there was a wedding at Cana in Galilee, and the mother of Jesus was there" (John 2:1, ESV). Some, on the other hand, are significant. The creation record, as with the other days of the week, allocates specific activity to the third day: dividing the sea and the dry land, the earth bringing forth vegetation, plants and trees, at the end of which, "G-d saw that it was good. And there was evening and there was morning, the third day" (B'resheet 1:12-13, ESV). It took three days for Avraham and Yitz'khak to travel to Mt. Moriah (22:4); it took three days for Laban to hear that Ya'akov had run for home (31:22); it took three days to fulfill the dreams of Pharaoh's chief cupbearer and baker that Yosef had interpreted (40:12-13,18-20). Sforno picks up on the phase "for I fear G-d" and explains, "therefore I will allow you to take home the provisions that you need". HaShem promises the people that if they will obey His voice and keep His covenant, they will be His treasured possession, a holy nation and kingdom of priests, "the L-RD said to Moses, "Go to the people and consecrate them today and tomorrow, and let them wash their garments and be ready for the third day. For on the third day the L-RD will come down on Mount Sinai in the sight of all the people" (Shemot 19:10-11, ESV). Just three short days later, "On the morning of the third day there were thunders and lightnings and a thick cloud on the mountain and a very loud trumpet blast" (v. 16, ESV) and HaShem pronounced the Ten Words in our hearing. The third day is when any left-over meat from a fellowship offering must be burnt (Vayikra 19:6-7), the first day of washing after touching a dead body (B'Midbar 19:12,19) and the day that King Hezekiah was healed, "I have heard your prayer; I have seen your tears. Behold, I will heal you. On the third day you shall go up to the house of the L-RD, and I will add fifteen years to your life" (2 Kings 20:5-6, ESV). Queen Esther fasted for three days and "On the third day Esther put on her royal robes and stood in the inner court of the king's palace" (Esther 5:1, ESV) to appear, although uninvited, before her husband, the king of Persia. Hosea challenged the people of Israel to repent of their sin, that on the third day, G-d would heal them and raise them up: "Come, let us return to the L-RD; for He has torn us, that He may heal us; He has struck us down, and He will bind us up. After two days He will revive us; on the third day He will raise us up, that we may live before Him" (Hosea 6:2-1, ESV). In the Greek Scriptures, the "third day" takes on a new significance as the day of resurrection, fulfilling Hosea's prophecy in its larger sense. Matthew tell us that "Yeshua began to show His disciples that He must go to Jerusalem and suffer many things from the elders and chief priests and scribes, and be killed, and on the third day be raised" (Matthew 16:21, ESV), while Luke records Yeshua saying, "everything that is written about the Son of Man by the prophets will be accomplished. For He will be delivered over to the Gentiles and will be mocked and shamefully treated and spat upon. And after flogging Him, they will kill Him, and on the third day He will rise" (Luke 18:31-33, ESV). Yeshua's words were sufficiently well known that after the crucifixion, the Temple authorities go to Pilot saying, "Sir, we remember how that impostor said, while He was still alive, 'After three days I will rise.' Therefore order the tomb to be made secure until the third day, lest His disciples go and steal Him away and tell the people, 'He has risen from the dead,' and the last fraud will be worse than the first" (Matthew 27:63-64, ESV). As we all know, Yeshua's words were fulfilled, so that when Mary of Magdala and the other women went to the tomb to wash and purify the body, they were greeted by angels who told them, "Why do you seek the living among the dead? He is not here, but has risen. Remember how He told you, while He was still in Galilee, that the Son of Man must be delivered into the hands of sinful men and be crucified and on the third day rise" (Luke 24:5-7, ESV). This became a key point of the gospel, as preached - "And we are witnesses of all that He did both in the country of the Jews and in Jerusalem. They put Him to death by hanging Him on a tree, but G-d raised Him on the third day" (Acts 10:39-40, ESV) - by Peter and Rav Sha'ul: "Christ died for our sins in accordance with the Scriptures, that He was buried, that He was raised on the third day in accordance with the Scriptures" (1 Corinthians 15:3-4, ESV). The L-rd was resurrected on the third day! What is the third day in your life? Are you waiting for a time of redemption or release? Are you in a prison or a dark place, uncertain of what is coming next and when this time will end? Are are you simply in a holding pattern, circling and waiting for permission to land or details of your next move? The answer to all of these issues is that the third day always comes. It may not come today, for today is almost now and more waiting may be required. It may not come tomorrow, for we can hold our breath until tomorrow and we can easily see that far; it is within our reach. But the third day requires the exercise of faith; it requires swallowing hard, breathing normally and holding on because the end isn't today or tomorrow, but is nevertheless certain. As human beings, we can usually endure things that have a fixed endpoint; knowing that there is a specific end - be that measured in days, weeks or even years - enables us to look forward to the time of release and hold on. But we struggle much more with indefinite or unending endurance. 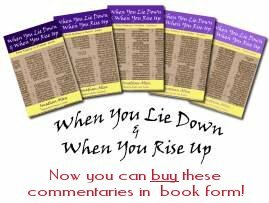 Rav Sha'ul wrote about this to the believing community in Rome: "Besides this you know the time, that the hour has come for you to wake from sleep. For salvation is nearer to us now than when we first believed. The night is far gone; the day is at hand. So then let us cast off the works of darkness and put on the armor of light" (Romans 13:11-12, ESV). Yeshua challenged the people of His day - "Do you know how to discern the appearance of the sky, but cannot discern the signs of the times?" (Matthew 16:3, NASB). We must each learn to recognise that our third day is drawing nearer, that our time or release is closer. This means that we must be ready, we must wake up and shake off lethargy or complacency and be ready to engage now with what is soon to be, so that we are already running as our feet hit the ground. Each of us has a calling on our lives and may already be engaged in walking that calling out right now; if so, then we need to be ready for that calling to intensify and be ready to pick up the pace. If we are still getting ready to walk in our calling, then we must be prepared for the lead time to shorten, for the call to get more urgent and perhaps for deployment sooner than we expected. We must be on a high state of alert, ready at any time to spring into action; as Yeshua said at the start of His ministry, "for the kingdom of heaven is at hand" (Matthew 4:17). At hand, about to happen, almost upon us, critically imminent, condition red. Remember what Yosef said to his brothers on the third day: "As I fear G-d, do this and live!" Application: Are you ready to obey G-d at a moment's notice, to just drop everything and go, or do you need a little longer to prepare? If so, then consider yourself put on notice as of this very moment and get that preparation done now!